As you know HTC and Verizon announced the Droid DNA and yes this phone is going up against the Samsung Galaxy S3 and Galaxy Note II, during the press conference they made it very clear that this phone will out do it’s competition, and make note just beacuse the Droid DNA has a 5 inch screen it is in no way a phablet. With technology rivaling the latest HD TV’s, the DROID DNA by HTC is the first smartphone to feature a true 1080p HD super LCD 3 display with Corning Gorilla Glass 2 protection. It boasts an extraordinary 440 pixels per inch (PPI) on a 5-inch screen for unprecedented in-hand HD experiences that delivers the maximum pixel clarity available on a smartphone. Designed to accentuate the incredible display, the deep black, soft-touch back is understated, with the exception of a metallic red camera bezel, while the red microgrill pattern of the sidewalls hint at the phone’s DROID heritage and the power inside. The beautifully crafted smartphone feels thinner than other devices of a similar size as the edges of the curved back taper to a mere 4mm for a comfortable feel in the hand or pocket. The Qualcomm Snapdragon S4 Pro processor, featuring a quad-core 1.5 GHz CPU and high-performance GPU, paired with America’s largest 4G LTE Verizon’s network from Verizon Wireless and a full 2G of RAM enable the seamless use of multiple apps simultaneously. With HTC Sense 4+ and Android 4.1.1 (Jelly Bean), you get great software experiences including Google Now. 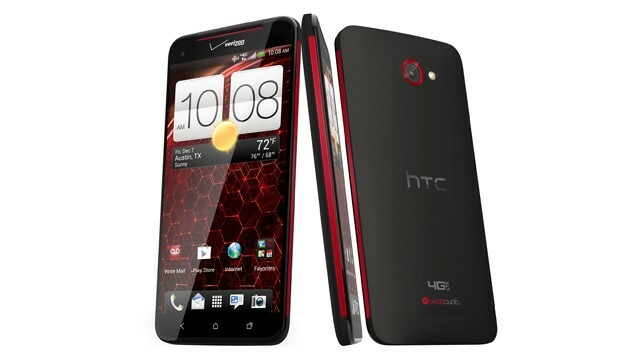 HTC Sense 4+ offers a wealth of easy-to-use and customizable features bringing highly sought after personalization to your phone and placing the most important content front and center. A series of intelligent features powered by HTC Sense 4+ also provides a number of improvements to the camera. The DROID DNA by HTC has a world-class camera that delivers fast image capture, great images even in low-light and an easy interface to capture stills and video. With an 8-megapixel f/2.0 28mm wide-angle lens, 5-level automatic flash, backside illuminated sensor (BSI), and superfast autofocus, you’ll capture amazing moments without the worry of missing a single one. Instead of choosing between photos and video, HTC VideoPic allows you to capture video and still images at the same time. And by simply holding the shutter button, Continuous Shooting takes multiple photos at up to four frames per second to catch all the action. It also includes a new best-in-class 2.1-megapixel, f/2.0, 88-degree, ultra-wide angle, front-facing camera that allows more to be captured in self-portraits, and up to four people for group shots. Auto Portrait makes it easier to take photos of yourself and your friends with automatic face detection and a countdown timer so you can focus on your pose and not the shutter button. Capable of capturing 1080p HD video, the front-facing camera also provides a sharper picture during video chat. The DROID DNA by HTC has a unique, 2.55-volt, built-in headset amplifier and dedicated amp for the external rear-speaker to help boost the audio signal to deliver crystal clear sound with less distortion, even at maximum volume. The combination of amplified hardware and the rich, authentic, studio-quality sound of Beats Audio allows music to be heard the way the artist intended, and enhances the sound quality while playing games or watching video. The DROID DNA by HTC is equipped with a 2,020 mAh battery and power saving software that enables long-lasting endurance. In addition, the embedded wireless charging makes it easy and convenient to top off power throughout the day or fully charge overnight, simply by setting the phone down. Finally, with near field communication (NFC), you can use the DROID DNA by HTC to share music and videos, add someone to your social networks, or download apps by tapping other NFC-enabled devices. The DROID DNA by HTC will be available exclusively from Verizon Wireless through a pre-order starting today at www.verizonwireless.com/droiddna, and in-stores nationwide beginning Wednesday, November 21st for $199.99 with a two-year customer agreement.